On the Internet, a 404 error means a broken or dead link at that particular address. Today's Nice Price or Crack Pipe Peugeot 404 is a link to the Gallic past, but will its price make you point your browser elsewhere? They say there's six degrees of Kevin Bacon, and much like that well connected actor, there are certain threads that bind together Volvo and Peugeot. One of those is the odd 90-degree PVR V6 used by the Swedes, Peugeot, and Renault in the ‘70s and ‘80s, and the other is the fact that yesterday's 1966 Volvo 122S is being followed today by a two-year newer Peugeot 404 wagon. Plus, both cars are painted sacre bleu. Coincidence? I think not. That Swede was fully restored and as such commanded a hefty price. The thing is though, Amazons that nice are about as rare as a feel-good Swedish film, and its condition garnered it an equally weighty 78% Nice Price win. Today, we'll see how the French do in comparison. The comparison is especially apt as the 122S was a close competitor to Peugeot's equally numeric 404. Designed by Pininfarina during their fin phase, the 404 in sedan form looks Xerox similar to the contemporary MG Magnette and Fiat 2300, both also products of the Italian design house. As an estate, well, it's downright elegant. The Familiale shared its platform with the sedan from the nose forward, but from there back it was all unique. That meant a longer wheelbase allowing for three row seating up top and a 4-coil rear axle (with complex Peugeot-built shocks) that could support over 1,000kg of cargo and still provide a ride for which the French are famous. This baby blue 1968 404 appears to be in decent shape and all intact. That's a good start as things like glass and trim will be hard to find outside of a Paris cour de ferraille. When New, the 404 had a choice of gas or diesel engines, but as the seller claims this one has a new rotor and distributor cap, as well as a rebuilt Solex, we can safely assume that it is powered by the 76-bhp OHV 1.6-litre. That cast iron four has a reputation for durability, and an odd three and one intake which gives it an iconic appearance. This Pug also looks to have the four-speed manual - with a fancy pants column shifter! That won't make it any faster, but will at least give you something to do while waiting the 20 to 30 seconds it will take to get the car to sixty. Inside, the dash looks like it's suffering from more cracks than a plumbers' convention and the Barcalounger passing for the passenger seat appears to have a tear in it. Or maybe that's just something sitting there. The carpet has gone all sepia tone from decades of sun, but overall, it seems perfectly livable as-is. There's no shot of the load area to see if the car has the lovely polished wood floorboards that were available, but if so that's reason enough to buy it. 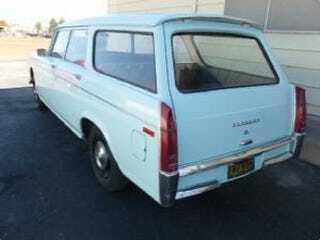 While it wears classic California black plates, the seller claims the car is now Nevada branded, and has a clear title. In fact, it's being offered in Pahrump, home to the Spring Mountain Raceway, and the inspiration for the Black Eyed Peas, who originally titled My Humps after the city, and included the lyrics Pahrump, Pahrump, Pahrump, I've got so much junk, down in my trunk, I really ought to take a dump. . . I bring that up because the Peas are really popular in France. The question for us of course is how popular is this French estate here in the U.S., and whether it's worth its $2,800 price. What do you think, does this mime mover look worth that? Or, is this a lug of a pug with a price that is fug? 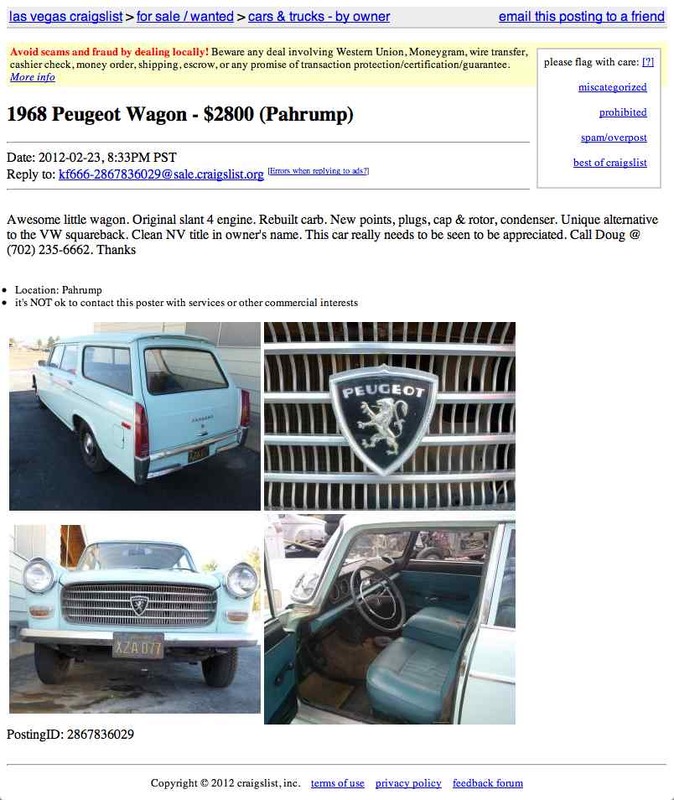 Las Vegas Craigslist or go here if the ad disappears. H/T to v8corvairpickup for the hookup!